On the 20th March 1943 the IRA staged a mass escape through a tunnel from Derry Jail. The escape was one of a series of high profile actions by the IRA in the north in the first half of 1943. The escape itself is well covered by an episode of the TG4 series, Ealú: To Hell and Back (currently not available online but worth a look if you can find it). There is a longer account of the escape on the blog here, so this article looks more at the wider context of the escape in terms of the IRA in 1943. Planning for the Derry escape had begun in October 1942 when a tunnel was started in the cell of Harry O’Rawe and Jimmy O’Hagan (there are also accounts of the escape in Uinseann McEoin’s Harry and The IRA in the Twilight Years). The prospects for the IRA at the time looked bleak. After IRA Chief of Staff Sean Russell’s sabotage campaign in Britain failed to put much pressure on the government in London, the IRA had not articulated a clear change in strategy. The outbreak of the world war in September 1939 had also dramatically altered the wider political context. Northern irritation at the IRA’s Dublin-centric leadership had culminated in the removal of Stephen Hayes as Acting Chief of Staff (deputising for Russell), ostensibly for betraying the IRA. Hayes, like Russell, actually appeared to be intent on recalibrating IRA actions to coalesce with the political ambitions of Fianna Fail, as it had done up to at least 1932. Sean McCaughey, the IRA Adjutant General who led the investigation of Hayes, suspected that this was somehow being facilitated by a resuscitated IRB. The world war had presented the IRA opportunities on two fronts. Firstly, the Allies desire for the USA to enter the war increased dramatically as the toll of their early setbacks mounted over 1940. Irish-America sensed an opening to leverage Ireland into the debate and countered some Allied propaganda by flagging parallels between the German’s treatment of other European territories with that of the British Empire, particularly Ireland. The presence of Sean Russell in the USA in 1939 had already raised the profile of the Irish issue (and effectively demonstrated that any value the English sabotage campaign, ultimately, had also lay in exerting pressure on the UK via Irish-America). The second front was in being able to draw lines between the British Empire and its enemies. Quite a lot has been written about the IRA and Nazi Germany, yet contacts were minimal, extremely erratic and apparently valueless to either side. In Belfast, over the same period, the IRA, was attempting to widen its political base by forming a Republican Club. This coincided with communists and the left pushing for a broad anti-fascist front and provided common ground. The Belfast steering committee included both IRA volunteers like Charlie McGlade, Jack Brady, Ernie Hillen and Tarlach Ó hUid, and, Communists, trade unionists and other interested parties like Malachy Gray, Jimmy Johnston and Jimmy Devlin (Ó hUid names members in his 1960 memoir Ar Thoir Mo Shealbha). Billy McCullough and Betty Sinclair were even to be jailed for publishing an article by the IRA in the left wing newsletter Red Hand. Over the course of 1939, the communist’s public language shifted from a broad ‘antifascist front’ to opposing Britain’s ‘imperialist war’. This initiative fragmented when Germany invaded the Soviet Union. The Communists position shifted dramatically towards supporting the Allies war effort in line with Russian foreign policy. The subsequent fallout among those involved in the Republican Club was to continue to colour events in Belfast for decades, denouncing republicans within weeks of Tom Williams execution in 1942 and reputedly betraying senior IRA figures and dumps to the RUC (see Swan, Official Irish Republicanism, 1962 to 1972, p93). What this more acute was that, in the wake of the Hayes fiasco, the IRA’s centre had shifted to the north and Belfast. By mid-1942, weapons were being relocated to the northern dumps in preparation for a proposed campaign. 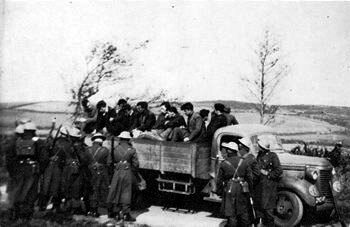 After the capture of the main dump in late August 1942, massive RUC raids saw over 200 arrested in the hours after Williams execution at the start of September. The northern campaign never materialised (although the lower Falls was put under curfew until December 1942). With no prospect of success via a military victory, again, whatever strategy was in place relied upon achieving sufficient publicity in the USA that Irish-America might demand an Irish republic be included in any post-war Versailles-type treaty. By the end of 1942 and start of 1943 it was becoming apparent that no negotiated settlement would take place as the Allies demanded unconditional surrender by the Germans. Subsequent IRA actions in the north in 1943 should then be understood as operations intended to generate as much publicity as possible, with two main audiences. The first was its belaboured supporters in Ireland, under pressure at home, and, interned on both sides of the border, and, both sides of the Irish Sea. The second was, as ever, Irish-America, and whatever future political support it might be able to deliver. The focus on the newsworthiness of the escape also explains some of the flaws in the IRA’s overall plan for the Derry escape. The success factors in the high profile escape from Crumlin Road prison that January were not replicated in the Derry escape (resulting most of those who escaped being immediately picked up and interned in the south). Despite considerable logistical support on the ground, the main thrust of the escape plan was to get those involved over the border. That was despite the fact that the southern government had been even more bloodthirsty in pursuit of the IRA than even the northern government. Consciously or not, the real value in the escape was in the newsworthiness. Photo showing prisoners re-captured by Free State soldiers in Donegal (published in Tim Pat Coogan’s The IRA). On the 20th March 1943 the IRA staged a mass escape through a tunnel from Derry Jail. The escape was one of a series of high profile actions by the IRA in the north in the first half of 1943. The escape itself is well covered by an episode of the TG4 series, Ealú. This article looks at the wider context of the escape in terms of the 1940s IRA campaign. Information about the escape was only disclosed to the Chief of Staff McAteer and the Northern Command Adjutant Jimmy Steele at an IRA army convention held in Ballymacarret in February 1943. McAteer and Steele had themselves escaped from Crumlin Road in January 1943. Finance for the Derry escape had already been (unwittingly) procured in a hold-up in Strabane on 2nd February by Jim Toner, O/C Tyrone, and his adjutant, Joe Carlin which netted £1,500. The outside operation was to be planned by Steele, Liam Burke, Harry White and Louis Duffin. Toner and Jimmy Clarke would help organise back-up. Word was sent in that the escape was to take place on the Saturday morning, 20th March, at 8.30am. The planning of the Derry escape had begun in October 1942 when a tunnel was started in the cell of Harry O’Rawe and Jimmy O’Hagan. The month previously, Tom Williams execution had coincided with a military campaign in the north by the IRA (the first formal northern offensive since 1922). A fifteen foot shaft had been sunk and then an eighty foot tunnel burrowed out towards a house in Hardinge Street and all the spoil disposed of. Communication in and out of the jail was by secret text between the lines of letters to Annie Hamill by her fiancé, Paddy Adams, who was O/C of the prisoners (she was also a sister of another internee, Sean Hamill). The tunnel was now nearing completion having gone through all manner of problems including water-logging, a collapse (nearly killing Billy Graham), and even having to dig under a coffin. The excavated soil from the tunnel even clogged the drains which had to be cleaned out but didn’t arouse suspicion. Twenty men were to attempt to escape, to be supported by waiting IRA units in Derry and across the border in Donegal. Selection was based on those who would commit to reporting back for duty to the IRA, north of the border, once they had escaped. Once the twenty had passed through the tunnel, any other internée was free to follow them and make their own way to safety. It was hoped as many as eighty might escape. For use in the Derry escape, Liam Burke had went to Currans to hire a furniture lorry and driver on the 18th March. The cost of the hire was to be £9 (this was paid to the firm after the escape). He and Jimmy Steele were to travel up to Derry in the lorry with the driver, called Davy, who was unaware of their true mission. The lorry was going to be left at the corner of Abercorn Place, so that the escapers, who were expected to emerge in Harding Street, could run down and jump into the back. The escape was confirmed for 8.30 am on the Saturday morning. There were three flights of steps at the top of Abercorn Place, where it met Harding Street, which prevented the lorry being moved to just outside the house where the tunnel would emerge but also meant that it wasn’t close enough to arouse suspicion. Liam Burke was to position himself at the top of the steps to guide any escapers to the lorry. The tunnel had been propped with bits of wood salvaged from around the prison plus sandbags made from pillow cases. In total 15 tons of clay had been removed for the tunnel. The sound of digging it up had often been masked by music practice. The tunnel itself had been completed before the IRA had organised the getaway vehicles and so there was a nervous wait inside the prison by the internees who were itching to get out. The exit was in the coal bunker of Joseph Logue’s house in Harding Street. The next day, Friday 19th March, Steele and Burke were picked up by the lorry which then began the drive up to Derry. On the way, the driver Davy wasn’t very talkative. He then stopped off at the main door of an RUC station in Castledawson, parked up the van, and went inside. Steele, sitting in the front seat, and armed with a revolver, had no idea whether the driver had recognised him (his niece worked for the same firm) or become suspicious and was, at that very moment, giving him away to the RUC. It can’t have been too far from his mind how Hugh McAteer, the previous October, had accepted an invitation to an old school friend’s house only to deliver himself, the Chief of Staff of the IRA, straight into the hands of the waiting RUC without a fight. Under the text were pictures and descriptions of himself, Hugh McAteer, Ned Maguire and Pat Donnelly. Eventually, though, Davy returned to the van, got in and drove off (it turned out he had got lost and went looking for directions). When they reached Derry, Steele produced his revolver and told Davy that his van was being commandeered by the IRA. Davy looked at the revolver and then told Steele that it wasn’t necessary as he was an IRA supporter. He even pointed out that he could drive the van better than anyone else so it would be better if he stayed with them. Steele explained why the furniture van was being commandeered but Davy agreed to remain with them and help out with the escape. As it was, he was the best placed to act as the getaway driver anyway. Steele and Burke had arranged to be billeted in a safe house in the city. Other members of the Belfast IRA had arrived separately, in twos and threes, to help in the escape. On the morning of the escape, the prisoners found that the mouth of the tunnel had been blocked. As time wound down to the escape the idea had begun to take hold that the authorities’ failure to uncover the tunnel was a rouse and the plan was simply to shoot the internees as ‘escapers’ as they emerged from the tunnel. So, on discovering the tunnel blocked, they assumed the escape was over. Outside, Steele and Burke were unaware of any of the dramas inside the prison as the agreed time of 8.30 am approached. By now, the prisoners had realised that the tunnel was blocked by two bags of coal which were then transported back through the tunnel and into the prison clearing the way for the escape. Burke then handed Kelly a revolver and directed him towards the van in Abercorn Place where Steele was still sat in the front with the driver. Back in the Logue’s house, Sean Hamill was keeping watch over the Logues as the other members of the escape team emerged from the tunnel. He remained there until the last man came out, even then delaying to make sure no-one else was going to emerge. Kelly had jumped into the back of the lorry while some others delayed in Abercorn Place. To free up space Steele and Burke were going to stay in the city, rather than leave with the lorry, and Ned Maguire took over in the lorry’s cab with the driver for the next part of the escape bid. A young girl who noticed the escapees in the street went to the prison gates and informed the staff (who were already suspicious that something was going on). By the time the warders discovered the tunnel, 21 men had passed through it and had escaped. Fourteen of them climbed onto the lorry. Some, including Harry O’Rawe, Hubert McInerney, Brendan O’Boyle, Chips McCusker and Billy Graham didn’t go on the lorry and made their way to Letterkenny on foot. Sean Hamill had remained in the Logues to prevent them raising the alarm. By the time he left the house, the lorry had already driven off. Having previously spent time in the city (he had originally been picked up and interned there), Hamill then decided to stay in Derry on the run, and felt able to make his way across the border. O’Boyle was the last official escapee, while Jimmy O’Rawe, the last to escape through the tunnel, was the first non-official member of the escape team to go through the tunnel and the only non-official escaper to get out. He didn’t know Derry well and was picked up during the blackout on Sunday night by the RUC. Those in the lorry drove off, making the four and half mile journey to Carrigans where they were to cross the border with the intention of linking up with the waiting IRA unit on the other side. The journey was pretty uneventful and the apprehension and tension among the escapers in the back exploded in a yell of triumph when they crossed over the border at Carrigans and travelled on to St Johnston where they were supposed to be met by another lorry. Instead, nine ended up surrendering that night to pursuing Free State soldiers and Gardaí. They were re-interned (a certain naivety still existed among northerners about the capacity of Fianna Fáil to support the unionist government), this time in the Curragh. A famous photograph shows eleven men captured by Free State soldiers in the back of a lorry. Photo showing prisoners re-captured by Free State soldiers in Donegal (published in Tim Pat Coogan’s The IRA. Having left the lorry (it was eventually found in Sion Mills), Steele and Burke made an uneventful train journey back to Belfast. Steele was dressed in his Auxiliary Fire Service uniform while Burke was dressed as a priest. After they arrived back in Belfast, the £9 was forwarded to Currans to pay for the hire of the lorry. Some, like Kevin Kelly, believed the timing of the escape was wrong and they should have gone out in the evening to take advantage of the blackout and then night-time. Within a week only three of the 21 were still at liberty. Lessons from the May 1941 and January 1943 escapes from Crumlin Road had not been learned, like not using getaway cars or trying to co-ordinate with outside help, with obvious consequences (in contrast, it was months before any of the May 1941 or January 1943 escapees were recaptured). Strategically, the IRA appeared to have an eye, either consciously or subconsciously, on the propaganda value of an escape over the immediate practical contribution freeing 21 experienced volunteers would make to its northern campaign. As the IRA’s centre had shifted to the north in the early 1940s, a growing emphasis was put on positioning the question of Irish unity on the agenda of any expected Versailles-style conference that might happen after the world war. The IRA’s sabotage campaign in Britain had started in January 1939, but by September the start of the world war held out the prospect that a British reverse might be a catalyst to the re-establishment of the Irish republic as declared at Easter 1916 (the IRA’s ultimate objective). By April 1943 then, the IRA’s northern offensive had largely petered out and by the middle of that year there was a clear shift towards dealing with prison issues. McAteer’s statement about the IRA’s thinking in March and April 1943 may also reflect growing public confidence in the possibility of an outright allied victory following Stalingrad and El Alamein and the realisation that a post-war conference to settle territorial claims and disputes was now looking unlikely. With the possibility of a Versailles-type settlement gone, as McAteer states, the priority was now “..to preserve the spirit of the movement”. That set the stage for next big propaganda coup of the IRA, its 1943 Easter Commemoration in Belfast, which I’ll cover another day. There are various accounts, including in Harry and The IRA in the Twilight Years, also an episode of the TG4 series, Ealú: To Hell and Back. Kevin Kelly, interviewed on Ealú. Information as related by Sean to his son Féilim. O’Rawe had stood and watched Eamon Ó Cianáin and others escape over the wall in Crumlin Road in May 1941, only for warders to arrive and end his chances of escape. O’Rawe had helped wrestle the warders away from Gerry Doherty who was the last man over the wall on that occasion. As Chips McCusker was standing with Liam Burke when Kevin Kelly emerged from Logue’s, those who didn’t go in the lorry appear to have chosen not to do so either to divide the escapers up to evade capture or due to lack of space (McAteer, writing in 1951, implies that they were left behind). According to Liam Burke’s account in The IRA in the Twilight Years, the driver and Ned Maguire took the lorry to the border, himself and Jimmy apparently staying the city. In Ar Thóir mo Shealbha Tarlach Ó hUid describes how a loose collaboration between the broad left in Belfast and the IRA in 1940 came apart over differing opinions over the ending of the German/Soviet pact with the German invasion of Russia. Joe Cahill (in Anderson’s 2002 biography of him A Life in the IRA) also relates that the moods in the prison and relations between warders and prisoners ebbed and flowed with the fortunes of the war and the changing alliances.